It’s hard to review any financial or technology-related media outlet these days without being bombarded by references to BitCoin, the digital currency that seems to have taken the world by storm over the past 6-12 months. BitCoin poses a pretty substantial challenge to business people: it requires sufficient understanding of computer science to appreciate its elegance and idiosyncrasies but, perhaps more importantly, it requires a sufficient understanding of finance to appreciate it vis a vis other fiat currencies and gold. Despite this complexity, business leaders are pressured to take a stance on this fledgling techno-currency. Most have chosen the safe approach writing it off as the latest Ponzi scheme with some even arguing that it will be the largest bubble burst in the history of Ponzi bubbles. I’m afraid I’m not so sure…And here’s why. 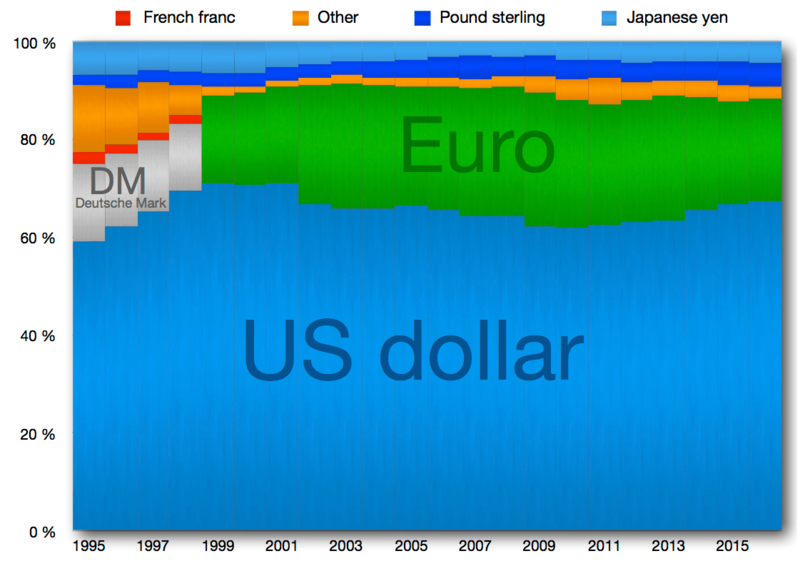 Distribution of global reserve currencies (Credit: Wikipedia). Let’s explore a few key facts. A remarkable 86% of the world’s reserves are currently held in two fiat currencies: the US dollar and the Euro (source: Wikipedia). These two currencies form the basis of the global financial system and are regulated centrally. The US dollar, accounting for a whopping 62% of currency reserves throughout the world, is completely controlled by the United States (through the Federal Reserve Bank and the Treasury). Now consider the fact that gross domestic product (GDP) of the entire world is roughly $72 trillion with the US and Europe making up 45% of that number (source: Wikipedia). More importantly, most of the GDP growth in the world is derived from developing economies outside of that 45% (source: Wikipedia): the so-called ‘BRICS‘ nations of Brazil, Russia, India, China, and South Africa. The natural question is why such high-growth economies, led by China, would want to depend on a currency completely beyond their control as their store of wealth. The even more natural answer is that the pressure to create a global currency not controlled by a single nation or union will rise sharply over the coming years. A solution like BitCoin, whether the perfect solution or not, might be preferable to some than a centrally-controlled dollar. Perhaps that explains why even regulatory-heavy China hasn’t taken any substantial steps to stem the growth of the digital currency within its borders. Update on 12/5/2013: China just made it illegal for its banks to convert currency to BitCoin. Augmenting the demand for a global currency are two traits of BitCoin’s design that draw a lot of interest: privacy and transportability. BitCoin’s decentralized, anonymous nature make it exceedingly private (with some caveats) while also providing a level of transportability that can’t be matched even by precious metals or fiat currency. Consider, for example, that BitCoins can instantly be transferred from any location to another, no matter how remote or rural it is. More importantly, the transferred amount can be as small or as large as desired; note, for example, that the fees associated with wire transfers limit the practical minimum amount to be transferred. Combining privacy and transportability may constitute the killer apps that make it a unique proposition. Ultimately, in my humble view, it’s clearly too early to make the call on BitCoin. Its meteoric rise has certainly been disconcerting as it’s recently reached hyperbolic-growth status. However, unlike many of my colleagues, I find it difficult to write it off. While I can’t say I believe it’s worth $1,000 per coin, I certainly don’t believe it’s worth $0. While I certainly plan on remaining “dollar-denominated” for quite some time, I’m very impressed and intrigued by the elegant solution that BitCoin delivers bringing together the world of computer cryptography and financial markets. At the explosive growth rate it’s experienced, I don’t think it’ll take too long for us to know the answer; but, it’s important to remember that even a collapse back to $100 does not mean that it’s not a viable currency — that just means that circumstances allowed a bubble to occur. This is completely analogous to the fact that a real estate bubble bursting in the US in 2007 in no way legitimizes real estate today. The more important question is whether the currency can survive such a bubble popping. Even more questionable is the fact that I can’t imagine it gaining much more traction without governments trying to step in to regulate it. Two reasons might explain the fact no government has yet stepped in: 1) creating legislation regulating it might give it even more legitimacy; and 2) it is very difficult to regulate Internet technology (e.g., peer-to-peer file sharing sites are still rather popular and hosted everywhere) since it crosses national boundaries. All in all, the next year will be rather exciting for those of us who love the intersection between the world of finance and technology. My bet is that, whether or not BitCoin is the digital currency of the future or something like it that comes a little later, we’re witnessing the birth of a monetary revolution. Update on December 5, 2013: China announced that it’s no long allowing its banks to deal in BitCoins citing risks to financial stability. This article was recently featured on WIRED Magazine’s Innovation Insights here. In What Currency Should You Have Invested Three Years Ago?